Haochen is a featured soloist of the Abu Dhabi Festival performing Sergei Rachmaninoff's famed second piano concerto alongside China’s National Centre for the Performing Arts (NCPA) orchestra at Emirates Palace on March 24. Haochen spoke with United Arab Emirates' The National preceding the performance; read his comments here including his thoughts about his new album release. Haochen is very honored to be the only pianist of the four 2017 Avery Fisher Career Grant recipients announced today. These Grants of $25,000 give professional assistance and recognition to talented instrumentalists believed to have great potential for solo careers. The ceremony at WQXR's Greene Space will be streamed live as a webcast here today, March 15, at 6:00 PM EDT. The radio broadcast of the ceremony will air on WQXR at 9:00 PM EDT on Monday, April 24. More information about this year's winners may be found here. Previous recipients of the Avery Fisher Career Grant include Gil Shaham, Yuja Wang, Jonathan Biss, Hilary Hahn, Joshua Bell, Escher String Quartet, Anthony McGill, and Augustin Hadelich. "Portrait of a pianist. Haochen Zhang was a pianist about whom aficionados were whispering expectant superlatives as he came through the Curtis Institute of Music. The next Yuja Wang, perhaps? Now, the 2012 Curtis graduate has released a studio album on BIS Records of some ambition: Schumann's Kinderszenen, the Liszt Ballade No. 2 in B Minor, Brahms' Three Intermezzi, and Janácek's Piano Sonata 1.X.1905, "From the Street." Some might recall the 2011 Curtis recital when he filled in for Wang after travel problems. Zhang, who won a Van Cliburn International Piano Competition gold medal in 2009, was 20 at the time of that recital, and many of the characteristics he displayed then are apparent in this recording: restraint and control - until a specific moment of arrival. The Kinderszenen are lovely, and he alternates between a gauzy dream state and great heat in the Liszt. Janácek arrives with a finely shaped sense of quiet, questioning wonder. Zhang's love for Brahms was clear at that Curtis recital. So, too, here, where he uncovers ideas well beyond those apparent from just the written note." Read on Philadelphia Inquirer's site here. 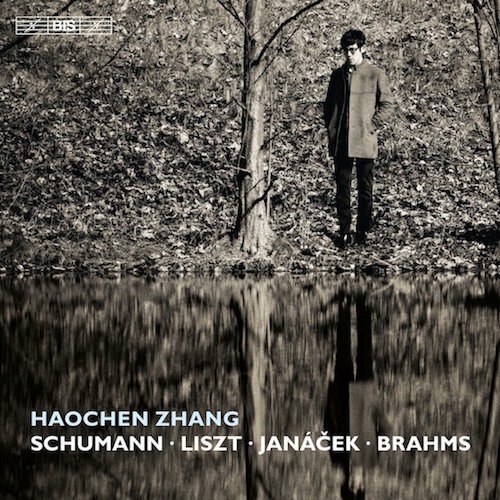 Haochen Zhang's Newest Album Available Now! Haochen's debut album on BIS Records is available for preorder now on Amazon and iTunes! Leoš Janáček: Sonata 1.X.1905 "From the Streets"
Haochen Zhang is delighted to announce the release of his first studio album on February 10, 2017 on BIS Records. The album features works by Schumann, Liszt, Janácek, and Brahms. "This album consists of works which not only speak to me in a very intimate way, but also connect with one another at a corresponding level of intimacy: as a whole they form a unique musical narrative. Although I have always been keen to learn and perform all genres and styles, I feel irresistibly drawn to music of a reflective and introspective nature. This is perhaps in part due to the inward-looking aspect of the classical culture of my home country which has fascinated me since childhood, and also to the innate introverted side of my personality." Available for preorder now on Amazon and iTunes! On November 13, Haochen Zhang launches a tour of Liszt's Piano Concerto No. 1 with the Hangzhou Philharmonic Orchestra led by Yang Yang in Prague. Other stops on the tour to include Italy (Modena and Faenza), Austria (Klagenfurt), and Germany (München). The tour is book-ended by two other European performances: a recital at the Emilia Romagna Festival in Italy on November 11 and a performance of the Rachmaninoff's Piano Concerto No. 4 with Orquesta Sinfonica Del Principado de Asturias conducted by Rossen Milanov in Spain on November 25. On September 4 Haochen Zhang opens the Macao Orchestra’s 2015/16 season, playing Liszt Concerto no. 1 with their Music Director Lu Jia, before re-joining them on their European tour in Linz, Budapest and Erl.